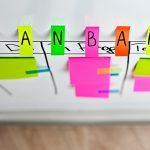 Kanban and Kanban boards have proven themselves to be both efficient and effective in the business sphere, but you don’t have to be a business to take advantage of Kanban and its principles. There is a wide variety of applications for personal Kanban, and you can use this list of ideas at home as inspiration, to make your home more organized, efficient and fun. 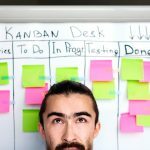 The personal kanban board is probably the simplest and most popular application of Kanban on a personal level. It’s a simple Kanban board with just 3 columns – ‘To Do’, ‘Doing’ and ‘Done’. It is really up to you if you want to use a digital solution to work with your personal Kanban board online, or if you’d rather have a physical board on the wall of your study or bedroom at home. Either way, this simple yet powerful visualization tool will allow you to handle your personal tasks in a more organized way, allowing you to increase your personal productivity. Just don’t forget to implement a limit on the Work in Progress allowed in the ‘Doing’ column, so you can stay focused and remain efficient. 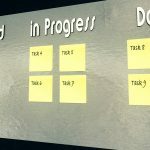 No matter if you are living with your family, some friends, roommates, or even by yourself, creating a dedicated Kanban board for the household chores might save a lot of time (and often prevent a lot arguments). When you are living with people, it’s often harder to divide the tasks, and people might feel like they are doing more than the rest, even when that is not the case. Making the list of chores, and who is doing what, visible to everybody allows everyone to understand their own part, and to see that others are putting in an effort as well. Additionally, explicit Kanban rules might be used to keep each person from having to do too much, while everything gets done on time. You can also create individual swim lanes for each person in the household, or use additional stickers to signify who is taking care of which task. The first Kanban implementation in Toyota didn’t really include a central visual Kanban board, but an integrated system that utilized signal cards that allowed demand to pull production. An extremely simplified version of that can actually make the creation of a grocery list an effortless and virtually automatic process. The idea is actually very simple, and the only thing you need to do is create a Kanban card for each product that you use on regular basis. When you buy groceries, you stock them in your fridge or pantry, together with their respective Kanban cards. While you keep consuming the items, you take the cards of the items that have run out, and stick them outside your fridge with magnets. This will provide you with a very clear visual indication of when you are running out, and what you are running out of. In this way, the system will be able to alert you when you need to go shopping in a straight-forward visual way. Before you leave, just take out your smartphone, and take a picture of your fridge, and you have a ready-made grocery list in less than 2 seconds. Or you can use paper cards, and when you run out of the item, remove the card for that item (usually taped to the product), and put them into a basket, then take the cards to the store with you. Each card should contain the name of the product, brand, size, and any other pertinent information (flavor, ingredients, etc). This worked really well for me personally, when trying to manage dog food. I setup a min-max level, so when I was down to 3 cans of dog food, I had a card on the 3rd can that told me to buy 6 more cans (min of 3, max of 9). Being a parent means that you have to teach your children to be independent, organized and responsible, while still being in control, and providing them stewardship and guidance. 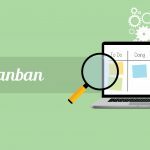 Striking the right balance between a hands-on and a hands-off approach can be a very difficult task, and Kanban can be a tool to help you achieve that. 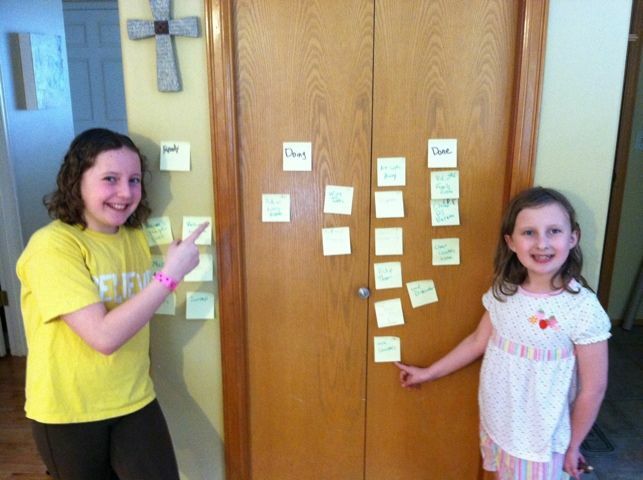 You can create a dedicated Kanban board for your children and the tasks they have. 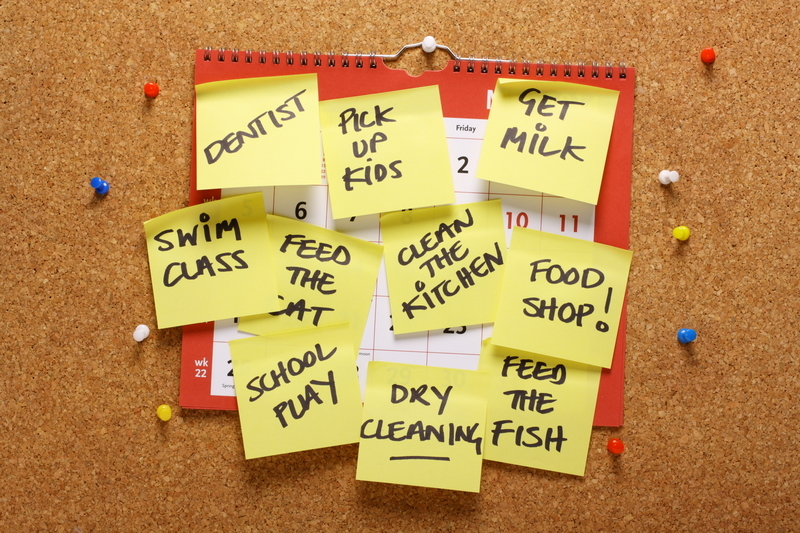 It might include house chores, schoolwork, their hobbies, playtime and important appointments and tasks. You can have explicit rules and WIP limitations to make sure they cannot get to playtime before they have completed their schoolwork. Having a visual board will allow you to exercise control and supervision, without robbing your children of a sense of independence. This also teaches them to prioritize and organize on their own. You can also use personal Kanban to manage larger events you might have coming up. As Kanban is an effective and efficient way to manage large workloads, it can be extremely helpful when planning weddings, anniversaries or other large events that are more than a simple party. If we look at a wedding as an example, we’ll see that there is a myriad of different tasks to be handled by a variety of people. While most of the work usually weights on the bride’s shoulders, there are always a lot of other people involved, and all of their efforts need to be coordinated. As the huge workload of organizing a wedding can be quite stressful, having a nice Kanban board to make everything organized can alleviate some of that pain. It will also make communication between everybody involved much easier, so more will get done, and fewer tasks will fall through the cracks. 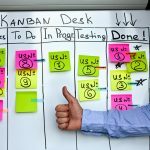 As you can clearly see by all the ideas above, personal Kanban has more than one way to help you live a better life, and there are so much more examples that we haven’t mentioned. Everybody can find their own unique way to implement it at home. You can be as creative as you’d like, as the Kanban approach is quite flexible, and can be applied to everything we do. we first started in the Food storage room doing a 5S-project 🙂 After we freed up space, we defined min/max per individual box in order to stop buying the next “special discount noodle offer” .